After Ryan Groves won the 2016 Rally Against Kids’ Cancer at High Plains Raceway, we chatted with him about how he got started, his road racing dreams, and what’s next for him. Frank Albert: How did all this start for you? FA: How did you get involved in road racing? RG: My first real experience with racing goes back to 2004 at Road America in Elkhart Lake, WI. I was lucky enough to drive a 1974 Porsche 914-6 around the track a couple of times, which left me with an incredible thrill. In 2006, I attended the Bob Bondurant race school for 3 days. While this was an incredible experience, and my first time behind the wheel of a Formula Ford, I didn’t go on to get my competition license that year. I simply didn’t have the resources to race at the time, but was very grateful for the experience I gained at the school. I can’t get through this interview without expressing an enormous gratitude to my wife, Stephanie. Typically, race cars and love stories don’t get mentioned in the same article, unless your love story is about your car, but that’s different. 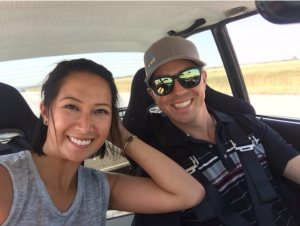 I am lucky to have a partner in life who puts up with all my car talk and everything that comes with being married to “not just a typical car guy”, but to someone with dreams to race on a circuit track and all that it brings. Fast forward 11 years…Like all things in life, you work hard to achieve certain personal goals. For me, it was to be able to one day own and drive a race car. This year I will be attending the RMVR Driver’s School and I can’t wait to learn from the best and finally get a full competition license! FA: Why RMVR and vintage racing? 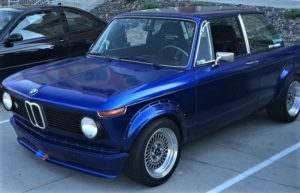 Ryan’s 1976 BMW street car. RG: This is a long story, but I will try to make it shorter. Somewhere along the way, I developed a huge love for the vintage BMW 2002. I began buying and building 2002s in my 1-car garage and developed an invaluable relationship with fellow BMW enthusiast, and long-time RMVR member, Art Krill. In 2016, I finished a 1976 BMW 2002 “Street Car” and drove it in the Rally Against Kids’ Cancer benefiting The Morgan Adams Foundation to fund pediatric cancer research. Through this event, I was introduced to many great people and passionate racers within RMVR. When the opportunity came up to purchase a 1969 BMW race car (a race car donated to The Morgan Adams Foundation), you can imagine this brought me right back to 2004 at Elkhart Lake…the dream was coming true. There is something about vintage racing that is un-explainable. Today’s race cars are loaded with sophisticated technology, which isn’t necessarily a bad thing. However, the simplicity and beauty of a 100% mechanical vintage race car is phenomenal. If you haven’t experienced it, watching these wonderful cars out on the track and to witness the preservation of these magnificent machines is an experience. FA: What are your plans for 2017? 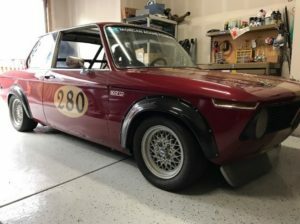 Ryan’s 1969 BMW race car. RG: This year, I plan to participate in most of the RMVR race events, and couldn’t be more excited to do so. I am by far the most excited to be racing in the 7th annual “Race Against Kids’ Cancer” on July 29-30 at High Plains Raceway. For us racers, getting to race our cars and help fundraise for such an amazing cause, is a very special thing. I encourage anyone and everyone to come out and watch the races and enjoy all the activities of the weekend! FA: What words of advice do you have for others who are interested in getting involved in road racing? RG: For those that are considering getting into racing, just go for it. The RMVR community has been incredibly welcoming and helpful to me as a new member. There is a sense of comaradery that I had never experienced before. At the end of the day, everyone is out there to have fun and race hard (and safe). I would gladly welcome contact by anyone interested and wanting to know more. Come out and enjoy a day at the track with us, participate in our Driver’s School, get a Lunch Ride in a race car at the Race Against Kids’ Cancer, smell the race fuel and exhaust, and be prepared to get hooked! My offer to anyone out there reading this article…come out to an RMVR race event and volunteer a bit of your time learning the track, the grid, the cars, and simply meeting the members. Find me by my car and introduce yourself, and I will gladly give you an up-close look at my car and introduce you to others in the club that can help you get involved. You won’t regret it. You might have to figure out how to go home and tell your significant other that you need to buy a race car…but that one is on you! Let’s do all we can to preserve the sport of vintage racing and the wonderful race cars we all love.